Suggested to investors as "Best Value" on the market today! This property, located at the entry to the rural countryside area of Golfito, was formerly a popular bar-restaurant location with a dance floor and secure off street parking. It’s tranquillo location, set between several nice homes and a few restaurant and cabina projects could lend itself to either a residential, multi-residential or commercial project. The seller had picked this property up after several years of abandonment. He made a redevelopment plan and was in the beginning stages of the transition when the project was suspended. A new septic system was installed, an outdoor “Rancho Style” bar-BBQ pavilion was built in, the old build out was removed and one end of the building was roughed out as a caretaker apartment…and then “the economic crisis” hit. Like so many others, this seller has not been able to return to the project in a few years and now feels he realistically will not be able to at any time in the foreseeable future. As it stands, there is a lot of potential here – for either commercial or residential use. The lot is fully fenced and surrounded lovely with landscape. It’s set back off the road on the main artery into Golfito. It could elegantly support a few townhomes or a small cabina project. It could be developed into a very nice home site with all the amenities…. And further it could support a mixed use such as a residence to the west and a separate entry business to the right. I can imagine this as a successful location for a mechanic, storage units, spa services, a family restaurant with recreational areas, or ???? It’s well situated and versatile. I really do consider it to be one of the best values on the market for any use. Waterfront Luxury Home with Ocean View. A Gracious New Home designed for commercial or private use with thoughtful amenities to accommodate your guests in style! The main residence is approximately 750 sq. meters of living space with quality block, steel and cement construction. All common spaces offer westerly vistas over the bay and island. This architectural design provides for ease in entertaining with a variety of generous living and recreational areas. 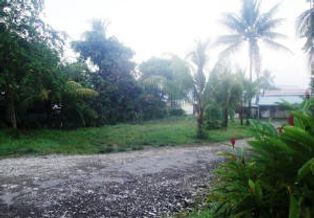 Surveyed at 6275 M2, this ample lot has gardens, recreational areas and plenty of secure parking and boat storage. Zoned for residential, multi-residential or commercial use. A great location for a "B and B" or top notch for a small sport fishing lodge. Room for a commercial retail strip or additional hotel rooms along the main street. 5 spacious "hotel style" bedrooms, each with fully tiled bathrooms. A Grand Salon open to the expansive waterfront view with wet bar. A large gourmet style kitchen with center island and pass through to huge dining veranda overlooking the bay! 2 additional guest rooms, Manager Quarters and Office, Huge laundry and secure storage room gives plenty of work space to a domestic staff and handyman without intrusion of the main home and guests. Bonus room located off the patio and overlooking the pool was built for gym equipment or game tables with it's own private bath (Easy 6th bedroom conversion). Fully tiled pool and a deep tiled jacuzzi. Large 'locker room' for changing with 2 showers-2 toilets-double sink vanity. Generous covered BBQ patio for entertaining with built in sink and outlets for a commercial size beverage cooler. Room for a pool or Ping Pong table. The entire property is securely fenced around the front with a stately block wall around the residence on the waterside. Gates from the gardens open to the bay, designed with the idea one may wish to add a private pier and dock or moorings in the bay out front. Lovely established tropical palms and garden areas surround the constructions. Lots of room for secure guest or public parking. Considering that less than 1/2 the area of this parcel is developed, this location could easily support a large second home, additional guest cabins or a small hotel development or be segregated for rental apartments or commercial use. The area reserved for this future development is over 100 meters along the main street of Golfito as you leave the commercial district and enter the boutique marina zone. The Municipal green belt in front of the property along the public road could be further enhanced with landscaping by the new owner for lovely 'curb appeal', integrating in the entries and auxiliary street front parking. 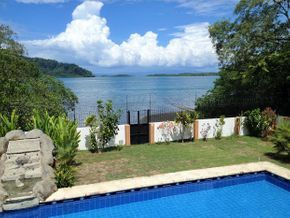 This gracious, partially furnished tropical home was designed to accommodate guests in comfort and style! Whether you plan a Commercial Retreat or a Private Residence or even a combination both- Considering the modern, high end build out and the potential, this property is most likely your best value per square meter on the waterfront of Golfito !!! Grand Salon with Wet Bar and Powder Room. Gourmet sized kitchen with central island. 7 Master Sized Bedrooms -each with adjoining full bathrooms. Sunset bar overlooking the pool and tropical landscaped patios. Outdoor Tropical hot tub with waterfall feature. Large poolside changing room with 2 showers, double vanity and 2 toilets. Recreation Room for Game Tables, Exercise Equipment or Spa-Salon services with full bath. Covered poolside BBQ patio with snack bar-beverage service area. Fully fenced and gated property with security features built in. Stately waterfront wall provides entryway for future pier or dock . All block, cement and steel construction with Teja Real Spanish-Style roof. Development Note: Less than ½ the land on this lot is constructed upon. This location could easily support a large second home, guest cabinas, apartments or even a small hotel. The Main Street frontage of over 100 meters is perfect for a small commercial ‘strip center’ which could offer multiple retail spaces and there is plenty of room within the compound for off street secure parking. The municipal green zone in front sets the property back off the road and can be custom landscaped by the new owner for lovely 'curb appeal'. For an investor looking for something with residential and commercial potential, on the waterfront along main street Golfito is a GREAT LOCATION with nearby restaurants, bars and marinas. 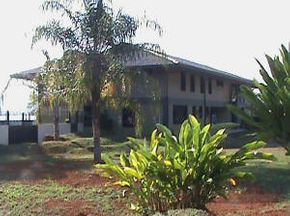 Principals or their representatives may contact the seller’s agent directly at Land Sea Services in Golfito for further information or to schedule a showing of this "premier property". New on the Market. Asking Price: $1,000,000. This centrally located property has real aptitude for commercial development into a retail or office complex, a small financial institution, or a small apartment- hotel project…. amongst other ideas. It’s perfectly situated for optimum visibility into a glass front showroom or lobby. Site designs could include access by either the principal road through Golfito or a turn off to the street running alongside- or even for cars to safely enter on one side and exit to the other. There is potential for parking both on and off site. The green belt along the stream on the opposite side of the road could be landscaped in such a way that views out the windows of your building could be lovely and protected. Designed right, a second floor would offer glimpses of the bay as well. We see this location as a key site as Golfito develops. Let us walk you around it to better communicate why we think this is one of the most interesting small commercial locations on the Golfito market.